A website requires three things: a unique online address (a “URL” or “domain”); a program that enables you to create the text, images, and functions that you want on the site; and a “hosting service” that houses your site on a server so it can be publicly accessed by anyone on the Internet. Photo by Sam Azgor, Creative Commons. While you can acquire all three of these things separately, if you’re a beginner, I recommend you choose a service that bundles them into one package. If you already own a domain name, most companies will let you transfer it. There are dozens of website builders that are accessible to Do It Yourselfers, but I’m only going to discuss three tiers: the “Ws,” Squarespace, and WordPress. What I like to call the “Ws”–Webs, Wix, and Weebly—are three of the major services that provide both free and paid options. They all offer a free cloud-based platform with a URL and simple tools to build and host your site. They have attractive templates, tips on how to create and promote your site, and some level of customer support. If you opt for a free website, there’s a catch: the name of the website builder will be in your web address (e.g. http://myrnagreenfield.wix.com/) and there will be a banner and/or footer for the company on your site. Sample footer on a Wix.com site. While the image is fairly small, frankly, if you’re running a business, you don’t want to look like you’re too cheap to pay for web services. For anything from $4 to $25 a month, you can upgrade your site so there are no ads and you can choose your own URL. Whether you choose a free plan or paid plan, one of the most challenging parts of building your own website is deciding on a template or “theme.” Almost all website builders offer pre-built templates where you can plug in your own text and images. And most products let you switch templates at any point, so you can try out more than one without starting over. Try to choose a template that is built for a similar purpose. If you’re planning to sell products from your site, find a template that is already designed for eCommerce. If you want to display your portfolio, pick a theme that is set up to showcase your work. And if you have your heart set on using a specific color, make sure the template allows you to customize the colors, like this feature in Webs. Webs.com provides this tool to help you adjust fonts and colors in your site. Here’s another challenge that applies to any website builder: Having great images is essential to creating a compelling site. Many web templates use very large photos. If the image isn’t gripping enough or is out of focus, your entire site can fall flat. Fortunately, there are lots of great tools to help you create better images. The downside to using one of the three Ws is that you may not be able to get the site to look exactly the way you want it to. For example, I recently built a website using Weebly, and though creating the three-page site just took minutes, I encountered hours of frustration trying to find a way to create tabs or columns for a restaurant menu. After several unhelpful email exchanges with tech support, I finally gave up on the column idea and used commas to separate the menu item and the price. While prices, flexibility, tools and support for each of the three Ws vary, the differences are small enough that unless you know exactly what features you’re looking for, I’d just choose whichever website builder has a template that looks like the site you want to create. For more help, there are plenty of online reviews that describe and compare the three Ws and other website builder options. Squarespace is a big step up from the three Ws and the majority of the free website builders. There’s no free version: Squarespace offers a 14-day free trial, but after that you have to pony up. A one-year small site contract is only $96, which is still pretty affordable. The built-in tools and templates allow you much more flexibility in manipulating text, creating exciting image galleries, and doing more with eCommerce. They have a large selection of how-to videos and their tech support is responsive. What I like about Squarespace is that it’s relatively easy to use, the templates are beautiful, there are modules for showcasing events, blog posts, and products, and it’s nicely integrated with MailChimp. 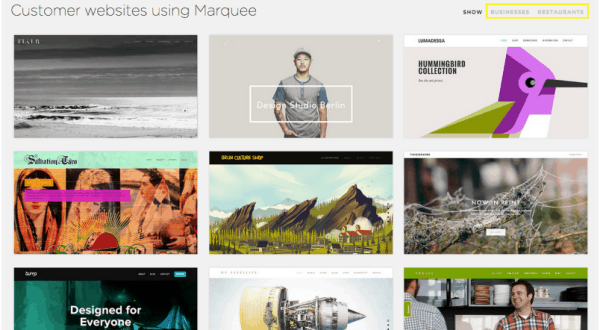 Examples of websites created using the same Squarespace template. What I don’t like about Squarespace is that many of the templates are better suited for artists and eCommerce sites than for brick-and-mortar stores. In addition, there are a smaller number of template options than some of the other website builders and a lot of Squarespace sites tend to have a similar look and feel. Wordpress is a fantastic platform for building a website. It’s extremely flexible and can be used for virtually any type of site, not just blogs, where it started. If you stick to one of the many templates and use the many free tools available, you can create a great-looking, complex website on WordPress without doing any coding. There are actually two versions of WordPress. The free equivalent to the “Ws” is called WordPress.com. It offers a website builder and free hosting in exchange for some advertising. For $100 a year, you can get a small site with a custom URL and no advertising. The “self-hosted” version of WordPress (also known as WordPress.org) is also free, but it doesn’t include hosting, so you have to be willing to find your own hosting company, such as Bluehost, iHost, or HostGator. Hosting costs for a simple site typically range between $50-$100 a year. There’s a huge international community of developers who create tools for WordPress.org (both free and paid) that can be used to make your website do almost anything you can imagine. And there are many books, website, videos and forums where you can find help for any challenge you have. There are two downsides to self-hosted WordPress. First, there are so many tools and choices that it’s easy to get overwhelmed. Second, it’s not as automated as the Ws or Squarespace, so it can be harder to figure out how to use. But if you have the patience to ask for help when you need it, you’re less likely to end with a cookie cutter website that looks like every else’s. All three tiers offer good choices for creating a good-looking site that will function well on cell phone and tablets. If you want something with virtually no learning curve, go with the 3 Ws or their ilk. For a classier looking site with more functionality, go with Squarespace. For a really versatile site that can do anything you need it to do, go with WordPress. Get more tips on planning your website.